Pep Guardiola’s men finally made it back on top after 52 days of the Champions trailing behind Liverpool’s dominating lead. Aymeric Laporte and Gabriel Jesus were the ones on the scoresheet in a 2-0 victory over Everton. Manchester City have had to wait 52 days to remind themselves what it is like to be looking down on the rest of the Premier League table and, having played catch-up for that length of time, it is fair to assume they will be happily enjoying the view from up there for the time being. Liverpool still have a game in hand to put them in front again, but it is a pretty good wake up call for Klopp’s men that the gap has significantly decreased. City were at a seven-point deficit to Liverpool at one point. Their latest triumph over Everton saw them scoring in the final seconds of each half through Aymeric Laporte and the substitute Gabriel Jesus. It came to no surprise as Everton form has been lacking lately having only won three of their last 12 fixtures. Marco Silva, facing growing scrutiny about his managerial record, had tried to shake up his team by leaving out four established and, in some cases, highly expensive players – Richarlison, Gylfi Sigurdsson, Cenk Tosun and his usual captain Seamus Coleman – and adjusting the shape of his team. Unlike Arsenal and Newcastle, City’s previous two opponents, Everton did at least stop Sergio Agüero opening the scoring inside the first minute. Indeed, they held off their opponents for longer than many people might have anticipated. When the breakthrough arrived it was stoppage time at the end of the first half and, for frustrated Evertonians, it came from a familiar route. No team in the top division has let in more goals from set-pieces this season. 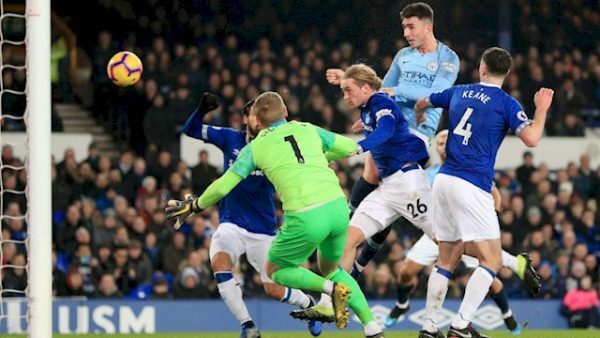 This was the 12th time Everton have conceded from a free-kick or a corner and nobody could say they were not warned about Laporte’s threat in the air. “It’s much better but we have played one more game, it’s the best we can do,” Guardiola told a news conference. “One month ago we could have been 10 points behind with the game against Liverpool and seven days ago we could have been seven points behind. Now we are top of the league. What is the lesson? Never give up. That is the best advice for all athletes.